What does citizenship ask of us? 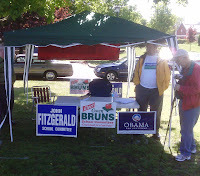 Alex Grant, Longmeadow resident and Assistant U.S. Attorney, wrote a column in this week's Longmeadow News that skillfully and accurately describes the now infamous confiscation of political signs from a political booth at last year's Long Meddowe Days event on the town green. The quality of his legal analysis befits a U.S. Justice Department attorney and the accuracy of his description of the confrontation on the green, he admits in the column, is due to the fact that he was there to witness the whole thing. As I read Alex's artful prose, admiring even the less flattering (though entirely accurate) characterizations of my demeanor that day, I first thought how fortunate it was that he was there to see it. After reflecting on the incident some more, I realized that dozens of people were there to witness this confrontation. While Mr. Grant was likely the only federal official sworn to support and defend the Constitution, there were other attorneys in the crowd as well as many well educated adults. It wasn't until I finished reading Mr. Grant's column that I fully grasped how alone I was in that crowd. In fact, the only intercessions made by citizens that day (other than my own intemperate one) were by folks urging me to be quiet and to avoid making a scene. I recall one women quietly assuring me that she and others in the crowd agreed with me, but that I was not taking the right tact. So why then didn't one of these folks take a different tact to prevent this violation of one of our most cherished principles as Americans? Why didn't Mr. Grant present his credentials and seek to explain the situation to the police on the scene? Why didn't anyone do anything during or after the confiscation? Before this incident I had written and lectured many times about the dangers of so-called "Spectator Democracy" but had not experienced it so acutely. On Memorial Day weekend we celebrate our town's place in American history and honor the huge sacrifices of our fallen warriors who died defending our way of life. What if they had decided not to defend our nation because they were not certain they were right, or because doing so would have spoiled their day and possibly made them look bad? Waving flags at Fourth of July parades, bowing our heads at Memorial Day remembrances, and applauding Revolutionary War re-enactments are gestures of respect and admiration for heroic citizenship past. These gestures are, however, rendered hollow when we let doubt, inconvenience, or embarrassment prevent us from doing our very small part when duty calls. The only significant way to honor our way of life is to live it, and to defend it when we can, as best we can. The Storrs Library in Longmeadow is participating in the Department of Conservation and Recreation’s Use Nature As Your Library program. This program allows library patrons to borrow a ParksPass and visit Massachusetts state parks for free. The Library is also a participant in the Mystic Aquarium Institute for Exploration library pass program. This program allows the pass users to save on the admission price to the Aquarium. The Passes for both programs are available at the Circulation Desk. For more information call 565-4181.